And people wonder why Methodists approve of sprinkling. I reiterate the rule to guide us: “Here we enter a fellowship; sometimes we will agree to differ; always we will resolve to love and unite to serve.” – E. Stanley Jones. As I have been preparing for this series, I had to ask myself a few questions. First, “Are you sure you want to do this?” When I decided that yes, this was something I thought was important enough to address at length, the question I then had to ask myself was, “If I’m going to spend a week on each of the primary modes of baptism, which one should I start with? What progression do I want to take, in terms of the quantity of water used in each: from the most water (immersion) to the least (sprinkling) or vice versa? Or should I start with the mode most frequently used in the baptism of y’all?” Well I decided to start with the mode that was most popular among those who rated them in the survey from a couple of weeks ago, and that result was immersion. To use a water analogy, I figured I would get my feet wet with immersion and work my way to the deep end of sprinkling. Maybe that sounds a bit backwards, but I’ve been a backwards kind of guy at times, anyway. So let’s talk today about immersion. Very few Christians have difficulty with immersion as a valid mode of baptism. There is a whole tradition within the Church universal, known as Eastern Orthodoxy, which immerses even infants when performing baptisms. Our Roman Catholic brothers and sisters will sometimes immerse adult converts to Catholicism. And most Protestant denominations and non-denominations who consider themselves evangelical use immersion on believers as the ONLY appropriate mode of baptism. This is true of Baptists, Church(es) of Christ, Pentecostals of all sorts, and so on. And yes, even we United Methodists, despite the reputation that we are afraid of water, will use immersion as the mode of baptizing persons who have not been baptized before, if that is their choice. There is obvious Scriptural support for immersion. 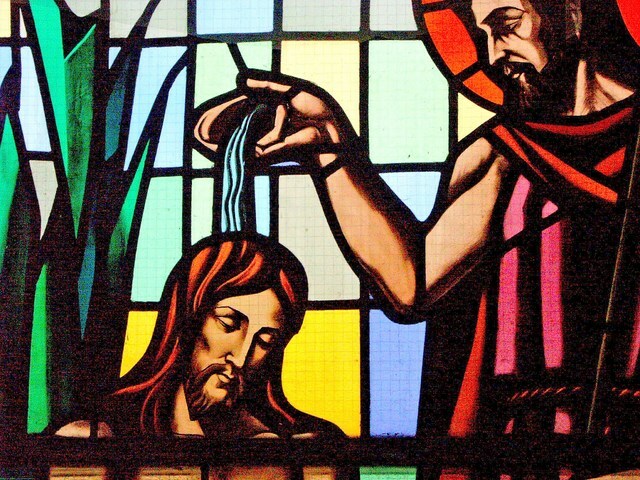 Most admit that Jesus was immersed when baptized by John, although others have said, “Not necessarily.” Some have suggested that when Matthew 3:16 says that Jesus came “straightway out of the water” after he was baptized means that he was standing in the water the whole time and that John took water and generously sprinkled or poured it over Jesus head. My guess is that many of you don’t see that as a likely interpretation, but acknowledge that there are many who do and that’s why you’ll often see artwork depicting John with a shell pouring water over Jesus head in the midst of the river. Therefore, what is often heard in some faith traditions is that the only appropriate mode of baptism is that which sticks as close to the literal meaning of the Greek term βαπτίζω as possible. And certainly most of us have access to enough water to be able to immerse a baptismal candidate. So it goes that for many Methodists who don’t immerse but could have done so, we will have been deemed unfaithful to the practice as laid out in Scripture, or at least for the language it was written in. But where this way of argumentation takes the wrong approach, in my view, is that it focuses more on the method of how the water is applied rather than on the purpose of the action. For even when the term βαπτίζω is used, there is a purpose behind it, and that purpose is “to cleanse…to wash…to bathe.” When we think about purpose and put it in these terms of “cleansing, washing, and bathing,” then we know that there are potentially a number of ways that this can be done faithfully. Stepping out of the realm of sacrament and baptism for just a moment, what comes to your mind when you hear those terms associated with “cleansing”? What method is most effective? Perhaps for some it is to take a bath; for others to take a shower; still for others using a wet cloth and scrubbing would get the job done most effectively. So, back to baptism, when we talk about being washed from sin and born of the Spirit (both inherent ideas in the theology of baptism), immersion is certainly a great way to convey this, but so are other methods. I’ll save those for the next couple of weeks. By now, you might be beginning to think about me, “You sound like a Methodist who’s afraid of water. You’re not giving immersion its full due.” Perhaps you’re right, but what I’ve been trying to show up to this point is that the argument that immersion is the only valid mode of baptism is not as rock solid as some would have us believe. We as United Methodists believe other modes may convey the purpose and meaning of baptism as well as immersion. Ironically, United Methodists are not as concerned with the “method” of how the water is applied in baptism as we are with the purpose of the action. By your grace, our lives we offer. The question of how (or what mode to use) is secondary, though it’s good to know the symbolism conveyed in each potential mode. Each portrays rich biblical imagery about the purpose of baptism. In addition to portraying our union with Christ’s story, Paul is also subtly alluding to an earlier story, that of the Exodus. The gist of this passage with regard to the Christian community is that we should no longer being slaves to what? Sin! That’s right. We have tasted and known the grace of God through the waters of baptism, just as the Israelites had been delivered through the waters of the Red Sea. And what a marvelous grace and deliverance that was, for the Israelites in the Exodus, for Jesus in the resurrection, and for us in baptism. What Paul is saying is that grace, that deliverance, that claiming of God over our lives in baptism is so wonderful that we are to live the rest of our lives trusting in the grace of God that brought us out of the land of Egypt, away from slavery to sin, and into the land of promise, the relationship and union with Christ. Now here’s where things get sticky and we begin to see things differently about this holy act. Many other denominations and traditions will refer to this act of baptism as an “ordinance,” whereas we Methodists and several other traditions refer to baptism as a “sacrament.” Of course, some make no real distinction between the two, but the main difference is in the approach. For many, the act as “ordinance” means that it is Christians obeying and doing what Christ commanded, or “ordered” us to do, by “baptizing” newly made disciples. And for those who see this as the work of humans, there’s no problem with doing it again and again and again. In many of those traditions, you can get baptized as many times as you want really. This shouldn’t the case for we who see this as a sacrament; that is, not the work of humans but the action of God in Christ. The purpose of baptism is not to acknowledge a decision, but to welcome God’s gracious action in Jesus’ life, death, and resurrection. To put it differently: you may have heard that baptism is an outward and visible sign of an inward faith or decision. But if we approach baptism as God’s activity, then it is an outward and visible sign of an inward GRACE. That God gives grace to us before we even know it means that it is not about our choice, much less a desired feeling. The grace is of the variety that cleanses from sin and gives us our identity. We believe that the One who does the baptizing is God. And again Paul says, when we are baptized, we are united with Christ in his death and resurrection. That only occurred once. So to repeat a baptism or to “re-baptize,” from my perspective, is to proclaim one or both of these notions: 1. That God’s action was insufficient; and/or 2. that it’s possible to crucify Christ again. (That is not to say that when people have re-baptized, they have intended to communicate this as such; that just seems to be the implications IF we believe that baptism is indeed the action of God uniting us with Christ in his death and resurrection.) As Paul says, “He died to sin once and for all with his death.” And our baptism, whenever that was, is a union with Christ in his death and resurrection. If we have been united with Christ in baptism, we have been claimed by God’s grace and we know that God’s mighty acts of deliverance do not fail. So as the beloved of God, being immersed in God’s redeeming love, raised and delivered from slavery to sin, let us live for God in Christ, living out and remembering our baptism through the power of Christ’s resurrection. In the name of the Father, and of the Son, and of the Holy Spirit. 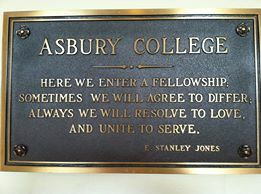 Outside the chapel at Asbury College (now Asbury University), where Carrie and I went to school and met, is this plaque. This idea resembles the posture I wish to use in the conversation we’ll be having in the coming weeks. It is based in the posture of humility. It is a posture, I believe, of what John Wesley called a “catholic spirit,” which was the title of one of Wesley’s better known sermons. The Scriptural text of that sermon of Wesley’s is the one from 2 Kings I read this morning. You will notice that the ‘c’ in ‘catholic’ is not capitalized. This means that I’m not here to spell out the Roman Catholic understanding of baptism. The word catholic simply means universal, as is evidenced in the Apostles’ Creed we recite weekly. So to have a ‘catholic’ spirit in this sense means to have a spirit that recognizes that there are multiple voices and opinions that are brought to the table of theological discourse on issues like baptism. “I might be wrong”…But I do think I’m right about baptism and am convinced to such a degree that I feel very confident and at home in the Wesleyan theology espoused by The United Methodist Church. Therefore, what I will be sharing in the weeks to come represent not only my own views, but the explanations of this doctrine and practice by our Church. “To think and let think.” Well, it is an unfortunate thing that, as I see it, Methodists for a long time have cast to the wind that first admonition “to think.” Why? Perhaps it was and is for fear of stepping on toes. Perhaps it is because we don’t want to be perceived as arrogant or argumentative. Perhaps we’ve been afraid of being perceived as imposing our views on those with whom we would like to welcome despite the potential areas of disagreement. And this has often led us as Methodists to be seen as a church where anything goes and we’re often considered as weak or “not as biblical” by other faith traditions on matters like baptism. We are fine to “let think,” to be okay with whatever people believe and think, which is great because we’ve opened our doors to folks with various sorts of backgrounds and that makes the United Methodist Church, in a lot of ways, a very hospitable place in which to worship and grow as disciples of Jesus, because of our welcoming spirit. And I know for many, possibly most or maybe even all of you, the phrase “United Methodist” on the sign out front is NOT the reason you are here. I understand that and respect it. But I also hope you all understand that if were not for those two words (United Methodist) on the sign, I wouldn’t and even couldn’t be here. So as someone committed to serve in churches in the Methodist connection, I am committed to helping our Church (both here in this congregation and in conversation with other pastors and leaders in the connection) get consistent in belief and practice on theological matters of identity like baptism. To return to the rule “to think and let think”…By casting aside the admonition “to think” through our own approach to theology and life, we have failed to speak with clarity about these potentially divisive matters. This lack of clarity has led to all sorts of confusion and a lack of unity amongst our churches about central doctrines like baptism. This confusion and lack of unity has been manifested in the unfortunately oft-used term “Christening”; it has shown up in the malpractice of “rebaptism” and in the lack of the practice and understanding of the baptismal reaffirmation service (you can find that on page 50 in the UM Hymnal); it has played out in the confusion on which modes (that is, how the water is used/applied) of baptism are appropriate, and so on. Facing the reality of this lack of clarity and unity, in 1996 the UMC adopted an official statement about our understanding of baptism that is recorded in a document called, “By Water and the Spirit: A United Methodist Understanding of Baptism.” That contains our official stance on baptism. But let’s be honest, it’s not like this study became widely known. I even wasn’t aware of it until a couple of years ago…and I’m a Methodist preacher!?!?! Now, some of you know either through hearing me tell part of my stories of baptism or by reading it on a series of blog posts where I stand on the issues and questions relating to the sacrament of baptism. Some of you have not heard or read my thoughts to date, but even if you have, there will be things I share with you over the next few weeks that I have not shared elsewhere. So I encourage you to join me in this conversation. Here in this opening message of the series, I want us to begin by laying all our cards out on the table. I’m not here to put on a poker face or to use some sort of secret attack or ploy. I am here for an open and honest conversation. Now here are my responses to the survey. 1. 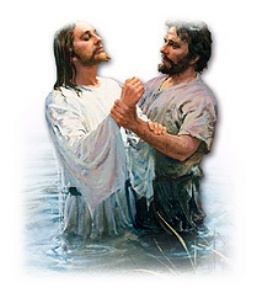 What mode of baptism was used when I was baptized? Aspersion, or sprinkling; 2. How would I rank the primary modes (immersion, pouring/affusion, and sprinkling/aspersion) of baptism in terms of what I find most meaningful? I have no preference. When counseling with candidates for baptism and/or their parents or sponsors I will lay out the reasoning and support for each and allow them to decide. 3. Was I baptized as an infant? Yes, although many referred to the act as Christening. 4. What is my opinion of infant baptism? I am strongly in favor of the practice. And I say to you that my mind changed on that. I grew up and was opposed to the practice until I studied the reasons for why the majority of the Church for 2,000 years baptized infants. And my transition to be in support of it occurred when Carrie and I were engaged. 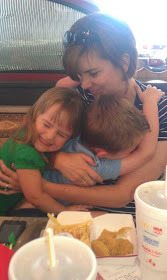 And given her upbringing in a nondenominational church that did not believe in infant baptism, we had to have many conversations about it because it would affect how we would proceed if and when the time came for us to be parents. We ended up on the same page. Therefore, Sam and Julianne were baptized in their infancy…Let me rephrase that…Sam and Julianne ARE baptized. I’ll explain why I say it that way in a moment. 5. Other than the UMC, what other faith traditions have I been a participant or member of? I’ve always been a member of the UMC, but there was one year in college when I attended a nondenominational church along with Carrie. As we grew into support of infant baptism, though, we switched to the tradition of my upbringing. So now you know where I’m coming from, and Carrie too. Now, let me show you where we’re heading over the next few weeks. I want to spend a week on each of the primary modes of baptism: immersion, affusion (or pouring), and aspersion (or sprinkling), laying the biblical reasoning and understanding of each. Along the way, it is my hope that we will clear up the muddied waters of our somewhat confused past. In this series you will hear me talk about the differences between our approach to baptism versus that of other faith traditions, some of which many of you have belonged prior to now. This next thing I’m going to say is huge, maybe even the most important theme of this series is that I will talk about the idea that the sacrament of baptism is not so much an experience as much as it is an identity. Baptism is first about WHO we are and with WHOM we are united (i.e., Christ); the questions of what and how are secondary. As it is about identity, that is why I said earlier that Sam and Julianne ARE baptized. I AM baptized into Christ. We will then conclude the series with a moment of a congregational celebration of reaffirming our baptismal covenant that I alluded to earlier on page 50 of the UM hymnal. There were some individuals among you who responded last week that you have not been baptized. If you would like to be baptized during this series or sometime in the near future, I want to invite you to speak with me either during the closing hymn this morning, after the service, or by yourself or your parent/guardian/grandparent calling, emailing, or sending me a message on facebook; whichever is most comfortable and easiest for you. “Here we enter a fellowship; sometimes we will agree to differ; always we will resolve to love and unite to serve.” Because our unity in love and service to Jesus and our offering of the Christ who heals to the world that hurts is how we live into our baptism, which is at the heart of our movement’s mission. In the name of the Father, and of the Son, and of the Holy Spirit.